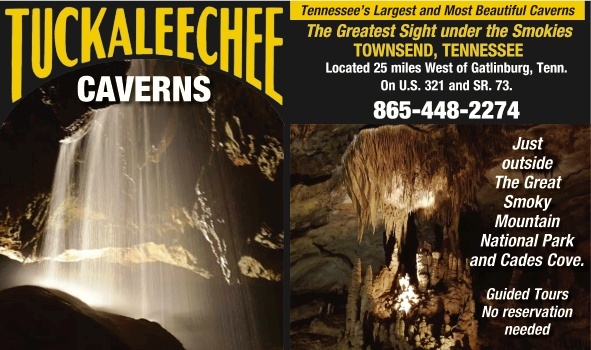 Tuckaleechee Caverns is 3 mi. s. of SR 73 (US 321) to 825 Cavern Rd. 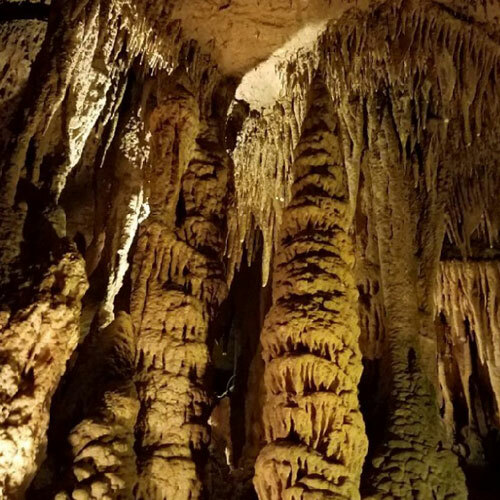 Although the caverns were known to the Cherokee Indians long before the first settlers arrived, they were not opened for public touring until 1953. For many years, locals congregated in summer near a sinkhole in Dry Valley where temperatures were mysteriously cooler than anywhere else. Two young Townsend boys found an opening near the sinkhole and spent many years crawling around underground. Throughout college they dreamed of creating a tourist attraction and later worked construction jobs in Alaska to earn startup money for their business venture. The pair spent four years clearing passageways and building concrete walkways by lantern light. One year after the opening, experienced cave explorers discovered a large room the size of a football field with 24-foot stalagmites. Today the Big Room is part of a 1-mile-long lighted walking tour that also includes a 200-foot-high double waterfall and several smaller waterfalls, a clear stream running throughout and such formations as ribbon flowstone, capillary tubes and onyx. Cavern temperatures remain a chilly 58 F year-round. Daily 10-6, Apr.-Oct.; 10-5, Mar. 15-31 and Nov. 1-15. Last tour begins 30 minutes before closing.